1 x Headband. - Material: Artificial Feather and Rhinestone. Specification: - Size of feather: 19.5 x 17 cm / 7.7 x 6.7 in. - Great hair accessory for dance ball, carnival, dress up party. - Color: Black. Its elegant chic design and 1920s great Gatsby style will make you look more charming, special and beautiful. 1 x Headband. - Material: Feather, rhinestone. - Color: Black and beige. Just buy it! Don't just think about it! 1920s Flapper Headband 20s Gatsby Headpiece 1920s Flapper Accessories Gatsby. Flapper Headband Black: 100% handmade with crystals. 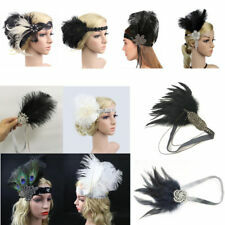 Black Feather Headband 1920s: free size, one size fits all. Crystal Hair Accessories: high quality crystals, and ostrich feather. Its elegant chic design and 1920s great Gatsby style will make you look more charming, special and beautiful. Type: Feather Headband. Material: Feather Sequins Rhinestones. Stunning 1920s style feather headpiece. This headband is beautiful. Featuring real black feathers, black diamantes and elasticated headband. This stretches to fit. Black (with a touch of silver) sequin stretch bandeaux / headband with feathers and a bead in a Charleston style. Material : Sequins, Spandex, Feather. Size : 38-40 cm (circumference) x 20-25 cm (feather height). Handmade 1920s flapper headpiece. 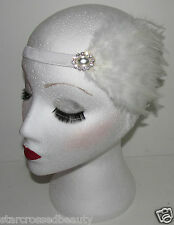 1 Piece of Flapper Headpiece. - One size fit most teens and adults, with elastic headband, easy to wear. Details: Elasticated Sequin Headband with Feather Detail and Acrylic Crystal. 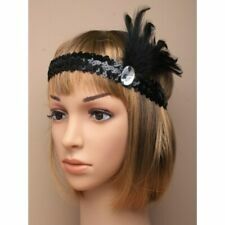 Flapper Style Sequin Head/Brow Band.